Fenric, eh? Time to talk undercurrents then. This story was originally called The Wolves of Fenric, a metaphoric reference to a number of characters in the story whose destinies had been predetermined by this week’s evil from the dawn of time. It was, I think, Producer John Nathan-Turner who suggested that because there weren’t any actual wolves in the story, and no doubt also that the concept isn’t completely explained until Part Four, suggested the titular curse as an alternative. Lots of Doctor Who stories changed titles before transmission, but it seems appropriate for this story, which is as interesting for what it doesn’t say as much as what it does. Fenric is as dense a text as any undergraduate semiotics student ever got their teeth into, and some of its most potent themes, specifically those concerning sexuality, are disguised throughout. JEAN: Blood warm. Nobody’s forcing him. Nobody ever forces you to come into the water. PHYLLIS: But everybody wants to. Deep down, everybody wants to come into the water. (Although this is problematic; when Jean and Phyllis go for a swim, they become monsters. By contrast, when Ace dives in at story’s end, the water has a cleansing, emotionally cathartic effect). But other themes are, like the Viking inscriptions under the church, harder to unearth. Dr Judson, codebreaker and inventor of the Ultima machine is a stand in for WW2 mathematician Alan Turing. Canny viewers may pick up on Judson’s disability (he’s confined to a wheelchair) as a reference to Turing’s personal restriction as a closet homosexual (as noted by writer Ian Briggs in the DVD extra Shattering the Chains). But few, I think, would cotton on to the idea that naval base commander Millington is also gay, and was the cause of Judson’s accident, through an injury inflicted many years before on a rugby field in a fit of jealousy. For that reading, one has to turn to Briggs’ novelisation. It’s a vivid read if you can track it down Ebay hounds, and reveals a few other juicy morsels, such as Miss Hardacre’s own experiences at Maidens’ Bay (turns out Phyllis’s retort “Just ’cause you’ve never been swimming!” was wrong) and Nurse Crane’s cooperation with the invading Russians (extra points, by the way, if you spotted that Russians are all named after characters in plays by Chekhov). In a way, the book is an admission that there’s more to this story than can be told on television, and more than can be said during family viewing hours. And on top of the subtexts littered throughout the story, we have the added complication of editing. Fenric ran way over length, and the transmitted version is cut with frenetic pace. Comparing this version with the 2003 Special Edition released on DVD is instructive. The 1989 version features a frantic energy rarely seen in Doctor Who (even by 21st century standards) but scenes start and end abruptly, and characters jump from location to location instantly. It’s an exciting but bewildering ride. The 2003 version reinstates missing scenes and reorders existing ones, and emerges the more coherent version, although it loses some of the exhilaration of the original. My memories of Fenric are confused between these two versions and the 1991 VHS release which was another, shorter remix. It would take a more dedicated viewer than me to tell you which scenes belong to which version (but actually, just go to DWM369 where David Bryher does just this in The Fact of Fiction). Add this complexity to those thematic undercurrents, and we have something unique in Doctor Who; a choose-your-own-version story, into which you can read as much or as little as you like. It’s Doctor Who to revisit time and time again. Just a closing word about Millington. He’s a loon, and not just because he’s crazed about the forthcoming end of days. The Doctor and Ace are clearly intruders, but he does nothing to apprehend them (his mate Judson was there when the Doctor forged the letter of introduction, so it’s not like he really thinks they’re from the war office). He’s more concerned with a baby being on base than them. The Doctor only has to mention some Norse mythology and that’s enough for Millington to tell him the Navy’s top secret plans to deploy chemical weapons. He orders the base’s communications equipment to be disabled for no good reason. He orders all chess sets destroyed, even though he could have no idea about the Doctor and Fenric’s unfinished game (and even if he did, what difference does it make to his plans?). Who put this guy in charge? “If this is a naval base”, Ace complains, “I’m Lord Nelson.” I tend to agree. Ah, well. At least he meets his end fittingly, shot by the unlikely pairing of a British and a Russian soldier. Which echoes Ace’s solution to the Doctor’s chess puzzle where the black and white pawns gang up on the king. See, there’s another of those undercurrents. This story just can’t help itself. 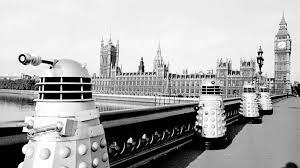 LINKS to The Dalek Invasion of Earth: World War Two shown thematically in The Dalek Invasion of Earth, is shown literally here. Both feature geniuses in wheelchairs. NEXT TIME: Thank you Miss Grant, we’ll let you know. Our next random jump takes us to a Frontier in Space. Welcome to the Dalek Invasion of Earth, twenty-one sixty-something AD. Well, actually we’re a bit late for the invasion, that’s all done. This is actually the Dalek Occupation of Earth. Well, I say “Earth”. In fact, we only see London and Bedfordshire. So really, it’s the Dalek Occupation of England. And come to think of it, these Daleks are a bit familiar, what with their one-sucker salutes and their talk of “the final solution”. So really, it’s the Nazi Occupation of England. But with animated robotic corpses and slythery monsters. A perfect story, as it turns out, to kick off my random trawl through Doctor Who. Because in lots of ways, this story – the series’ tenth – sets a template for most, if not all, Doctor Who stories to follow. Until this point, Doctor Who stories had been an eclectic bunch, with the Doctor and his companions stumbling into new (or old) situations and being swept along with events. The Dalek Invasion of Earth is very different; the TARDIS crew arrive, find a problem which needs fixing (the aforemetioned alien occupation) and spend the rest of the story fixing it. Once they were travellers. Now they are heroes. This change is starkest in the Doctor (William Hartnell, playing the role with shambolic relish). When we first met him, back in 100,000BC, he only tolerated planet Earth. Now, his first instinct is to defend it. 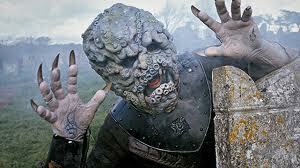 “We are the masters of Earth”, a Dalek croakingly gloats at him early in Episode Two. “Not for long”, the Doctor promises, with quiet menace. That Dalek will soon wish it had stayed submerged in the Thames. The change in the Doctor is reinforced by those around him. Yes, he’s still a cranky old goat, but he commands a new found admiration in people. We might expect that his granddaughter Susan might say “he’s a fantastic sort of man”, or even schoolmarmish Barbara to gush that he’s a brilliant scientist. But supporting characters and Dalek rebellers Craddock and Tyler also develop a gradual respect for him, and thus the audience are sent an important signal that this dotty old curmudgeon can take on an army of alien killers spread across the globe and win. The story then divides into three strands, centred on Barbara, Ian and The Doctor/Susan, with each party making its way to the Dalek mine in Bedfordshire. (Daleks love mining and on this occasion, they plan to replace the planet’s core with an engine, and joyride the Earth around the cosmos for reasons which remain unclear.) In the final episode, these three strands fit together snugly to form the story’s resolution. The Doctor comes up with a scheme which disables the Daleks, Barbara reprograms the zombiesque Robomen to attack them and Ian has dislodged their subterranean bomb, meaning its detonation will destroy their base. All three subplots have paid off, thanks to some skillful writing from Nation, pulling off a difficult dramatic trick but making it seem effortless. The one character who should be the centre of attention is sidelined throughout. This is the Doctor’s grandaughter Susan, who leaves at this point, the first of many comings and goings for the series. Of Doctor Who’s inital quadrille of characters, Susan is the one the writers seem to have the shakiest handle on, and her character varies widely in each story: is she a reckless teenager, a gifted telepath or a helpless screamer? The only constant is one inspired by creator Sydney Newman’s orginial notes when assessing the series’ plans for its regular cast. He scrawled: “need a kid to get into trouble”. “So our other characters can rescue her”, is the unstated extension. Still, she gets into trouble well. Indeed, she is the instigator of our heroes’ problems when in the first few minutes of the story she falls off a small wall, injures her ankle and somehow brings a bridge down on top of the Ship. Her schoolteachers tsk at her. Her grandfather openly scolds her. “You need a jolly good smacked bottom!”, he rails. Thus the script positions her firmly as a child and a quite useless one at that. Throughout the story, this uselessness continues. When taken in by the rebels in Episode Two, while it is established that Barbara can contribute by cooking (so liberated! ), Susan can only eat. And whereas Ian and Barbara are capable of holding storylines on their own, Susan must always share the limelight with the Doctor or rebel/love interest David Campbell. This enables her to be saved from ticking time bombs and sewer dwelling alligators by the nearest man. Throughout the story she falls for David, and at the its end, there is the inevitable marriage proposal (directly strangely, with the actors’ backs to the camera). Like the audience, the Doctor has guessed that this is about to happen, and in order to force Susan to accept David’s proposal, he locks his granddaughter out of the Ship. It’s astonishingly harsh; the subsequent explanation that Susan would never had left him voluntarily serves only to emphasise the point that she has been robbed of coming to that decision herself. “You’re a woman”, the Doctor tells her from inside the spaceship, but she still needs others to make life changing decisions for her, it seems. This undermines the inference that she’s grown up over the course of the serial. But it hardly matters, because as an audience, we’ve seen no evidence of that. She was never given the chance to show us that. And if the pay off for growing up is that is that you get to marry the first skinny rebel that comes along, learn how to cook and work on a farm, then it seems a poor exchange indeed. Even to the last, that kid’s still getting into trouble. NEXT TIME: We play the contest again, as our next randomly selected story is…The Curse of Fenric.